Another way of distinguishing between beta and correlation is to think about direction and magnitude. 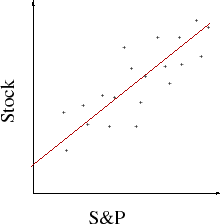 If the market is always up 10% and a stock is always up 20%, the correlation is one (correlation measures direction, not magnitude). However, beta takes into account both direction and magnitude, so in the same example the beta would be 2 (the stock is up twice as much as the market). Beta has no upper or lower bound, and betas as large as 3 or 4 will occur with highly volatile stocks. Beta can be quite important, but it is often completely misused. It is often referred to as a measure of risk. If you want to know how risky an investment is, look at the volatility directly. Consumer Staples stocks are thought to be less affected by cycles and usually have lower beta (often between 0 and 1). Procter & Gamble, which makes soap, is a classic example. Other similar ones are Philip Morris and Johnson & Johnson. Utility stocks are thought to be less cyclical and have lower beta as well, for similar reasons. Tech stocks typically have higher beta. An extreme example for the tech sector is the dot-com bubble. Tech outperformed everything in sight in the late 1990s but it also cratered in the early 2000s, worse than the overall market. Many precious metals and precious-metal-related stocks are beta-negative as their value tends to increase when the general market is down and vice versa. Beta can be zero. Some zero-beta assets are risk-free, such as cash. Some used to consider Treasury bonds to be zero-beta, risk free assets though during the dark days of 2008 and early 2009, one could make the argument that treasury bonds had a negative beta as investors fled the stock market and bought Treasury bonds for their perceived safety. Which goes to show you that beta can change drastically depending on market conditions. Many people are extremely reluctant to take losses and therefore opt for investments with low volatility. Other people are willing to take on additional risk because with it they receive the possibility of increased reward. Which one are you? It is very important that investors not only have a good understanding of their risk tolerance, but also know which investments match their risk preferences. Beta can help. By using beta to measure volatility, you can better choose those securities that meet your criteria for risk. Investors who are very risk averse should put their money into investments with low betas such as utility stocks and Treasury bills. Those investors who are willing to take on more risk may want to invest in stocks with higher betas. Beta can also be used in portfolio management to adjust the risk profile of the overall portfolio. For an investor who has a "somewhat" risk-averse attitude, a high percentage of the portfolio could be allocated to low beta securities and a small percentage could be used to chase superior returns via high beta stocks that are more prone to volatile market movements. As described above, beta is defined as the relative volatility of a stock’s returns compared to those of the market. We can use a simple line to represent this relationship. You might remember from your high school geometry that the formula for a straight line is y = a + bx. In this case, we replace the b with the Greek beta. We use a stock’s returns as the dependent variable or Y and the returns from the S&P 500 as the independent variable or X. The steeper the line, the higher the beta. See the chart below. The beta we calculate is historical, though we often use it to estimate the required return for the stock into the future. Since the calculation of beta uses past prices, there is a limit to how useful it is to project beta too far into the future. You know that phrase that every mutual fund advertisement uses: "Past returns are no guarantee of future returns". Beta is subject to the same kind of caveat. From the point of view of determining whether a stock's beta is acceptable, there are a several things to look at. Is the stock's beta consistent with the industry sector? A utility stock with a high beta has something going on and investors should be cautious. Likewise, a tech stock with a low beta implies its high-growth period may be behind it. Is the stock's beta consistent with an investor's risk tolerance? For investors who fear volatility, a high beta investment requires that the investor make a very careful evaluation of the stock in order to be comfortable holding that stock. Or the investor may want to reject the stock altogether as a potential investment. An investor's time horizon is important. Investors need to make a distinction between short-term risk -- where beta and price volatility are useful -- and longer-term, fundamental risk, where big-picture risk factors are more telling. High betas may mean price volatility over the near term, but they don't always rule out long-term opportunities. Taking these factors into consideration can make it easier for an investor to assess the beta of a potential investment. Needless to say, beta should never be the only criteria used to gauge the suitability of an investment but it can be an important consideration. I hope this post makes it easier for you to use beta in your own investing.